With the aid of our expert exporting and manufacturing team we specialize in offering best quality Elastomeric Rubber Cables. The manufacturing unit utilizes latest technology machineries and good quality resources to produce these rubber cables. These cables are scrutinized before exporting for ensuring superiority by trained individuals. 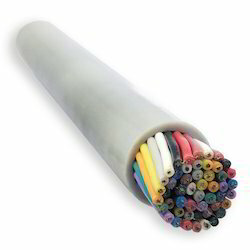 These rubber cables are provided at industry rates to our customers along with customizations. Bhuwal Cables enjoys a pioneer status in manufacture of Elastomer Cables in India and has been supplying these types of cables since 1981 to our various clients like Railways, Ship-building, Steel Plants, Cement Plants, Power Plants and Mining Sector for the last more than 30 years. The Company has a state of the Art manufacturing facilities viz. Niehoff multi wire drawing machines, OTOMEC Electroplating tinning, Bunching Machine, Continuous vulcanization lines, high quality and high speed extruders, Core Stranding/Laying machines etc. We have established all testing facilities also for Elastomeric Cables. We are in a position to process various types of compounds like EPR, EPDM, PCP, CSP, CPE, Silicon, EVA Halogen free and Fire Resistant non Toxic Compounds. We are also offering cables with braiding of ATC, GI wire, Sythentics or Textile Yarn and Glass Fibre. 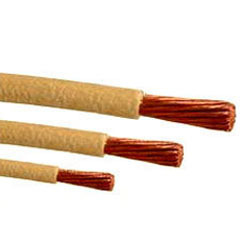 Bhuwal Cables offers Elastomeric Insulated cables upto 33 KV for Power and Trailing. Flexible Trailing Cables for Reeling Unreeling, Trailing Festooning, Mobile Machines, Cranes and Coal Handling and Conveyors. For Steel Plants we offer cables which can withstand high temperature for Furnace, Melting shops and material handling including CRD cables. Wind Mill and TUV approved Solar Energy flexible cables that are designed to withstand to meet the harsh environmental conditions. Solar cables offered meet the requirement of gasoline and petroleum resistance and ideal cable ensuring long term photovoltaic system performance for Solar installations. Rodent Resistant Solar cables are also available. By utilizing skills of our dexterous workforce, we are offering a comprehensive assortment of HT Elastomeric Cables. We manufacture these cables by employing optimum quality material along with sophisticated technology in adherence to the defined industrial standards. Our cables have wide application in all kind of industry and are used at home too for wiring. To meet the diversified requirement, these are being offered in various sizes, shapes and colors. Owing to our state-of-art manufacturing unit and the usage of leading-edge technology, we are able to present a comprehensive range of Elastomer Cable . Keeping in mind current market development, these cables are manufactured by our qualified professionals employing premium quality raw material and modernize tools. Our offered range of product is praised for being solid or stranded, insulated and is used for welding applications inside electrical or electronic devices. We introduce ourselves as one of the noted manufacturer, trader, exporter and supplier of Control Cable. The best quality of raw material in a perfect ratio is used to manufacture our offered cables. These cables are precisely tested for tested conductivity, tensile strength by our dexterous professional which helped us to come up with such distinct range. These cables are available in full range of sizes and shapes at industry-leading prices.